​Identify two ways to escape from every room in the home. If smoke, heat or flames block both of your exit routes, stay in the room with the door closed. Place a rolled towel underneath the door. Signal for help by waving a brightly colored cloth or shining a flashlight at the window. If there is a telephone in the room, call 9-1-1 and let them know your exact location inside the home. 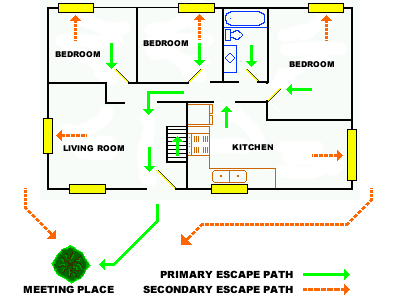 Create your own Home Fire Escape Plan and know two ways out of every room.